These tumbled Blue Chalcedony healing gemstones range from opaque to fairly clear with varying shades of blue. They are a medium size of about a 1/2" and larger. Great for carrying in your pouch or pocket. 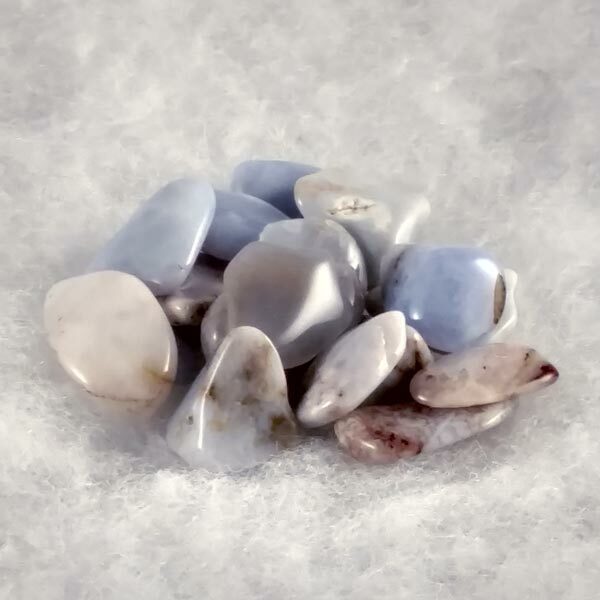 Blue Chalcedony encourages brotherhood among all and is beneficial in balancing the energy of body, mind and spirit. Brings awareness of the sacredness of life, adds to knowing that one is part of a universal plan and wholeness. Advances spiritual growth and maturity. Brings respect for the sacredness of every path, respect for the Earth and all that live on it. Produces harmony within ourselves and with others. Blue Chalcedony has a trigonal crystal system and is in the mineral class of oxides in the quartz group. Its coloring is generally light blue to white, sometimes yellow and it can be partly banded. It is known as a pure, fibrous quartz that is formed at temperatures below 100 degrees celcius from solutions that are rich in silicic acid. It is usually a primary formation and rarely occurs from a secondary origin. Blue Chalcedony gains its light blue coloring from what is called the 'Tyndall effect'. As light is bent through its microscopically fine crystals, the red portion of light is absorbed and what our eyes see is the reflected blue portion of light. Chalcedony is part of many stones used in healing and they each carry its benefits as well as their own. Some familiar to many would be Blue Lace Agate, Bloodstone, Carnelian, Jaspers, Onyx and Petrified Wood. Blue Chalcedony can be held, used as jewelry to wear for extended periods of time, or laying directly on the body. Blue Chalcedony encourages brotherhood among all and is beneficial in balancing the energy of body, mind and spirit. It represents both aspects of communication- the ability to listen and understand, and to communicate effectively. Just as it is able to mold itself into spaces available during its formation, it enables us to accept new situations without resistance without losing our own character. Blue Chalcedony provides us with a light-hearted and carefree feeling for life in a very optimistic manner. In enhancing our conscious self awareness, our perception of our needs, desires, feelings and emotions are enhanced. This enables us to learn of our true motives and provides the ability to change what we don't like. Blue Chalcedony improves our oral dexterity and ability to effectively speak in foreign languages (not in a magickal sense :D you would need to have learned the language). This mineral provides us with remaining mentally open to new ideas and eases understanding by helping translate ideas we agree with into action. Blue Chalcedony has been found to alleviate the effects of colds or smoking. The banded varieties are particularly encouraging to regeneration of mucous membranes. It has been very beneficial in helping with complaints that are caused by changes in the weather in that it has an anti-inflammatory effect. It is also effective as an aid in producing mother's milk which is formed in the breast in the same type of manner that this mineral is formed in the earth. Blue Chalcedony has a special affinity with Cancer and Sagittarius but is beneficial to all signs. It's Planet is the Moon, its Element is Water and its Energy is Receptive. 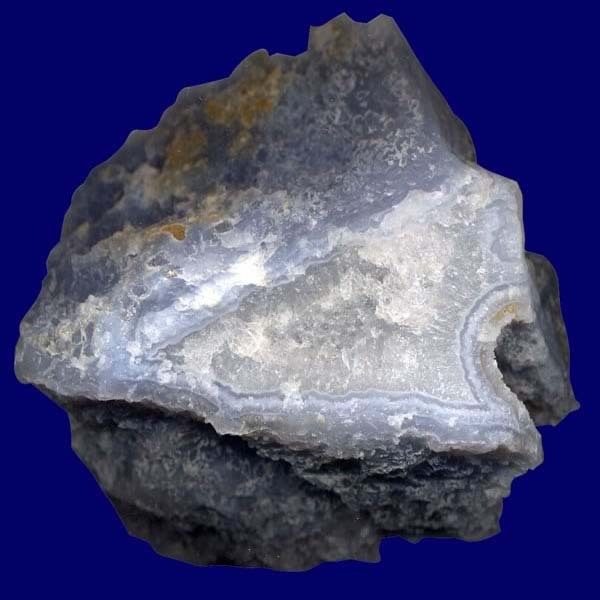 Blue Chalcedony was known to the ancients and represented the elements of air and water. It was used for weather magick and for healing ailments connected to the weather such as colds, circulatory problems and sensitivity to weather changes. During the 16th century, magicians would prescribe this stone to dissolve illusions and fantasies. When used for those purposes it would have been drilled and strung on a cord to be worn around the neck. It was also prescribed to drive away nightmares and fear of the dark and used under the pillow during sleep. In Renaissance times, a piece would be engraved with the figure of a man with an upraised right hand. This pendant was then worn for success in lawsuits as well as for safety and health issues.